Produktinformationen "3A X DC STEEL AGE BATMAN 1/6 SCALE ACTIONFIGUR DAY RETAIL VERSION"
From 3A Trading Company. 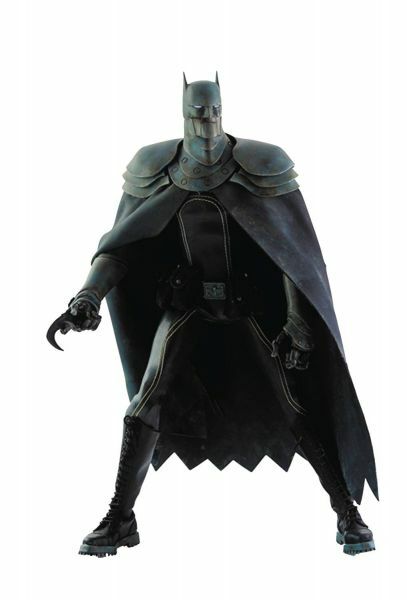 Officially licensed by DC Comics, this stylized figure of Batman stands 13 1/2" tall and has 50 points of articulation (including articulated fingers & segmented neck armor), a highly detailed sculpt and weathered paint application. Additional features include: a faux-leather tailored outfit with soft PVC Iconic Scalloped Cape with flexible armored pauldrons & faux-leather lace-up boots; 2 Batarangs; and LED illuminated eyes (requires 3 AG1 batteries, not included). Available in Day (Retail Exclusive) and Night Versions. Weiterführende Links zu "3A X DC STEEL AGE BATMAN 1/6 SCALE ACTIONFIGUR DAY RETAIL VERSION"
Kundenbewertungen für "3A X DC STEEL AGE BATMAN 1/6 SCALE ACTIONFIGUR DAY RETAIL VERSION"